Hot. So. Hot. I woke this morning feeling twenty years younger. Then I opened my eyes and realised I hadn’t wet myself, I’d sweat myself. I showered and dried. Then sweat again. I walked to the shop, but soon slowed to a slumped staggered. I felt like a tortured sprite being forced along the length of a burning matchstick. The air was saturated with the warm, sticky smell of eucalyptus being drawn from the gum trees. My house has no air-con. My house has no fan. Hot. Oh. So. Hot. This laptop is whirring to the beat of its own little fan and my freezer is filled with frozen figurines. Dance ladies, dance. Forty-four degrees. That’s what they’re saying. The hottest in a hundred years. That’s what they said. I don’t believe them I decry, “it’s hotter! It’s got… to be… h-otter?” As I walk passed the television, I pause. This must be some cruel trick? They can’t be playing tennis! It’s so damn HOT! The Australian Open is one of the highlights of the Melbourne calendar, and this year it coincided with the surreal temperatures of a freak heat wave that’s sent Melbourne into the giddy mid-forties (+110F). The afternoon Reb and I ventured through the gates they called it off due to severe weather. It was entertaining none the less, and briefly watching the circuit comic, Mansour Bahrami smash returns from his chair to Pat Rafter was worth a rivulet or two of sweat, and the beer was cold. To further highlight the eclectic nature of Melbourne, two days before this I was throwing my hands in the air (like I just don’t care) to the sounds of the Arctic Monkeys and letting it all out to The (awesome) Prodigy. Apparently that makes me a Prodigy Warrior. Thanks Keith. 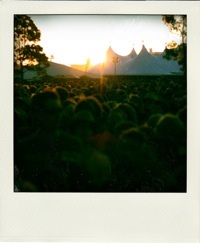 That was Big Day Out, just one of a handful of awesome music festivals booming along the south of Australia this summer. This month is all set to be manic. Reb’s dad arrives today, and will be the first time Reb has seen any of her family since her departure in June 2007. Not to mention it’s the first time I’ve met any of the in-laws. (For those new to The Trail, Reb and I met in China). Pops’ visit is quickly followed by a visit from my own nomadic parents, and in the slim interim between, Reb finishes up working, and we pack our bags and hit the road. That is actually quite alarming. As I look around our bedroom I see its filled with all the pointless debris you’d expect from a six month lay over, but none of the equipment one would expect of a five month road trip across the largest, sparsest country in the world. Going off on a complete tangent (that’s a travellers prerogative) there is an option for UK (and probably other) visitors to Australia to extend their Working Holiday Maker visas to a two year period. All you have to do is pick fruit for three months. Sounds simple, right? It scares the hell out of me. For a start, I get scared when I even hear Incy Wincy Spider let alone go face to face with the infamous killer arachnids. Jeees. Even the word arachnid freaks me out. Arachnid. Arrrgghhh. Arachnid. Arrrgghhh. Arac… Then I’ve heard stories of mango pickers having their forearms burned by natural acids. Oh, and then there’s snakes, though they have never bothered me (that could turn out to be a bad thing). The reason I’m telling you this is because we may well end up in this rut as five months is not a long time to see Australia. Regardless of how long we’re staying in Australia, we now know how long we’re staying in Melbourne for and that is just over three more weeks. Three more weeks to recoil from semi-settled expats into our favoured state of blemished backpackers. Can you tell I’m excited? Wahoo! Arachnid! Arrrgghhh! Thats why we have air con!!!! and can you find a job to sponsor you? then you dont have to worry about picking fruit? Hey there. I’m in Australia too at the moment although not really feeling the heat (cause I live in Dubai), although I have been blogging about it. Just discovered your blog via Eric’s Travellers Vs Tourist debate. Loved your response. Linked to Eric’s post and your own blog today over at my own. @Matt: The problem with sponsorship is you have to remain working, whereas I want to remain travelling. And air-con would be great. Fantastic. Sublime. We took a temperature dip recently, but tomorrow… you guessed it… back to the mid-forties! @lara: Welcome over, it’s great to know my rants are heard from time to time. Eric’s Traveller vs Tourist was a great one. Look out for more from me on TravelBlogs in the near future. I’ll be checking your site out from now on, from what I’ve read so far it’s a great read.